Cincinnati, OH—Cincinnati’s west side has a new brewery that opens to the public this Friday, June 30 with a grand opening ceremony at 2 p.m. Located at 3044 Harrison Avenue, West Side Brewing will tap the first beer to mark the opening of the 12,000 sq. ft. brewery and taproom. Mayor John Cranley and other dignitaries are expected to be on hand for the opening ceremony. West Side Brewing will open with nine beers on tap including pale ale, amber ale, common ale, Scottish ale, stout, session IPA, double IPA, hefeweizen and extra-special bitter. It will also have four wines on draft and taps dedicated to guest beers from other local breweries. Additional beers will be introduced in the coming months. Formerly the Wullenweber Motors Company building in Cincinnati’s west side, the building underwent a $1.3 million renovation constructed by Furlong Building. 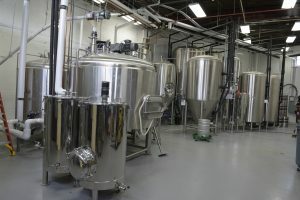 “We are excited for the public to see West Side Brewing and how we have repurposed the building that will be a great addition to the western Cincinnati community,” said Furlong CEO Jude Hehman. WORK Architecture + Design provided the architectural design for the building. 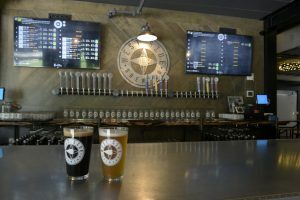 West Side Brewing will be open beginning June 30th from 4-10 p.m. weekdays, from noon until 1 a.m. on Fridays and Saturdays and on Sundays from noon until 10 p.m.
Furlong specializes in design-build construction, additions and renovations for commercial, industrial, office, medical and retail projects. The company currently has thirteen employees and was awarded the Tri-State Success Award by Cincy Magazine for the second year in a row. The company was named to the Business Courier’s Fast 55 list of the region’s fastest growing companies in 2013, 2015, 2016 and again in 2017 and has been named to the Northern Kentucky Chamber of Commerce Emerging 30 list of growing companies in 2014 and in 2016. Services are provided throughout the Tri-State and Midwest Region including Ohio, Kentucky, Indiana, Michigan and Tennessee. For more information, visit www.FurlongBuilding.com or call 859-647-2999.